My husband and I first tasted this dish 14 years ago while living in New York City. I am a California native who believed Olive Garden was authentic Italian food. Moving to New York changed my notion of Italian food. We didn’t have a lot of money and I was afraid to order outside my comfort zone out of fear of wasting money. However, I quickly realized you can never have a bad meal in New York. We lived in the Bronx and frequently ate at a restaurant named Pasta Pasta. One day, I decided to “walk on the wild side” and order something new. The menu description read, “Pancetta, vodka, and cream.” How could that possibly be bad? When the waiter placed the dish in front of me I was struck by its color. I took one bite and was instantly in love. I experimented quite a bit to capture Pasta Pasta’s version. Now my family is completely hooked on this dish. I find myself out of time in this holiday season, and I’m grateful for the ease and taste of this dish. Perfect for a busy weeknight, and tasty enough for entertaining. Buon Appeptito! Boil water in large pot for pasta. Add olive oil and pancetta in a large skillet on medium heat. Cook pancetta until lightly brown, about 5-8 minutes. Add shallots and soften for 2 minutes. Add garlic and cook for about 1 minute, or until aromatic. Add crushed tomatoes, vodka, and crushed chili peppers and bring to boil. Lower heat level to medium low and simmer for 10 minutes. Once the pot of water has reached a rumbling boil, add salt and pasta to the water. Cook pasta for 7 minutes to ensure al dente. Add cream to the sauce 2 minutes before the pasta is finished. Once pasta is cooked and strained, combine it with the sauce. Turn off heat, and add parmigiano-reggiano, basil, and black pepper. Serve with a rustic baguette, glass of wine, and garden salad. 1. I ladle the pasta from the water using a slotted spoon to reserve the pasta water. If my vodka sauce is to tight, I can add pasta water to loosen it. 2. Brown the pancetta enough without burning because it will soften in the sauce. Soft undercooked pancetta is not appetizing. 3. I do not add salt to the vodka sauce. 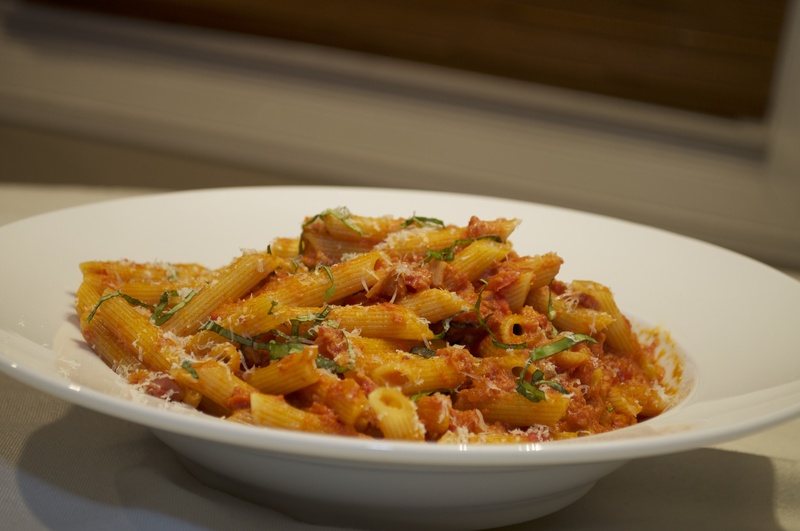 The salted pasta water, pancetta, and parmigiano cheese add enough sodium to the dish. 4. I love the mild onion flavor of a shallot, but an onion can be used in it’s place. 5. I used pre-chopped pancetta and pre-shelled fresh garlic to save time. 1. Leaving out pancetta or bacon will not drastically effect the dish. My penne al forno is definitely inspired by this dish. Add a little gardein, and you’ve got a great veggie option with protein. I’ve never tasted your Penne al forno. I would love to try it. You use ricotta salata right? Do you use vodka? Hi Karen, YUMMY! Thank you for my favorite PENNE ALLA VODKA recipe. I hope my comes out as good as yours. Does it matter what kind of Vodka? I usually use cheap vodka like Popov. I’ve had to use Absolute Vodka when I ran out of the cheap stuff. I can’t tell the difference between them. Whatever you have will work. We made it. It was so good. I guess Sandy told you the story of running into John at Vons. I had sent him there to get the ingredients that we didn’t have and there was Sandy buying her ingredients to make the recipe. Anyway keep sending these great recipes. Sandy did tell me she ran into John. Great minds think alike I guess. Sandy asked me a great question that I should have added to my cook’s note. I never wash the pasta after it’s been cooked. The starchiness helps the sauce adhere to the pasta. Thanks for the feedback! The Penne Alla Vodka was awesome!!!! We are looking forward to the next receipe!!! !